Never miss a tip! Subscribe to receive Mac OS X Tips in your inbox. Apple released a new beta version of Safari yesterday, bringing a whole load of new features, as well as a couple of problems. Here are a few tips to help you get the most out of the new version and solve any teething problems you might have. As this is just a beta version, Apple doesn't include it in the automatic Software Update. 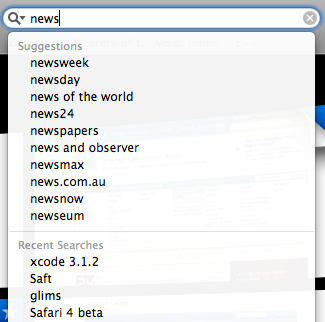 To get the new version, head over to the Safari 4 beta page on the Apple web site. Bear in mind this will get rid of Safari 3, but there is an uninstaller included if you ever want to revert back. While most plugins for Safari should be fine with the new version, InputManagers are likely to need updating. 1Password has released an update, but you have to go to the 1Password app in your Applications folder to access it. Go to the Preferences and in the updates section, check the box that says Include Beta versions. Now when you check for updates it should download a version that works with Safari 4. Updates for Glims and Saft are already available from their respective sites, but as far as I know PithHelmet and SafariStand haven't been updated yet. This one is mainly for developers. If you are using the 3.0 version of Xcode, you will find that it crashes on launch once you have downloaded the Safari 4 beta. Just head over to the Apple Developer Connection to download version 3.1.2 of Xcode that works fine. Now Control-Tab will allow you to cycle through your tabs (as opposed to Command-Tab that cycles through applications). Don't worry if you were used to the old shortcut though, Command-Shift-Arrows still work. The new zoom feature works just like Safari on the iPhone. Instead of just increasing the font size, it increases the size of images and other media too. You can access this from the View menu or with the Command-+ and Command-- shortcuts. Alternatively, choose Customize Toolbar from the View menu to add the zoom button to the toolbar. To bring back the new tabs on top, just repeat the command with TRUE at the end. You will need to restart Safari for changes to take effect. As before, repeat with TRUE at the end to bring back suggestions. Unfortunately, the new spinning progress indicator doesn't give you a good idea of how far the page has loaded. To bring back the old style, you have to use both of the following commands. Repeat both commands with TRUE at the end to go back to the new style. Repeat with TRUE at the end to bring back Cover Flow. Repeat with TRUE at the end to revert back to the original behaviour. Repeating with TRUE at the end will enable Top Sites again. Repeat the command with TRUE at the end to enable the fancy completion list again. If you click the Edit button in Top Sites, it is easy to use the pins to force sites to stay in Top Sites. To manually add a site that isn't already there, open it up in a separate window, then drag the favicon (next to the address) over to one of the positions in Top Sites. You can also drag sites from your bookmarks to Top Sites. Supposedly the next version of GrowlMail should fix this problem.